When people ask me what types of things I make, I find it hard to give a straight answer. See, I have something I call Craft ADD. I get really interested in some craft and will be completely absorbed by it. Then something clicks in my head, or I see something, and all of a sudden I'm like "oh I want to do that now!" and I go off and do that. I've been knee deep in ornament and plush making. I was trying to think what I was going to get for my boss for our Secret Santa at the office, when out of nowhere (that I'm conscious of anyway) I decided I wanted to make her a cute little purse/clutch. So that's exactly what I did. 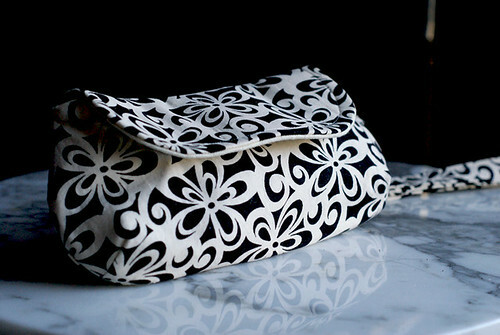 I bought the Curvy Clutch pattern from Keyka Lou. This is my first attempt at any kind of purse making, so it took me a while to complete since I was learning while doing and working with new materials like stiff stabilizer. I'm pretty happy with it, and only have a few things I'd change for next time. Since I used a much heavier stabilizer than is called for, it was a lot harder to turn, but I eventually managed. I may try a drop-in lining next time to see how that works, because I really like the heavier stabilizer. It gives it a nice professional feel/weight. I can't believe its 10 days until Christmas. I'll be finishing the last ornaments for the season I think, and listing them in the shop tomorrow. The rest have all sold out online. Then I'll be wrapping up gifts for friends and family. I'll be one busy bee until Xmas day, I'm sure. That's really cute! I like the fabric you used.